Homes in fracking zones to become uninsurable? Looks very much like it – and worse! See the article below in the Sunday Times of 13/04/14. 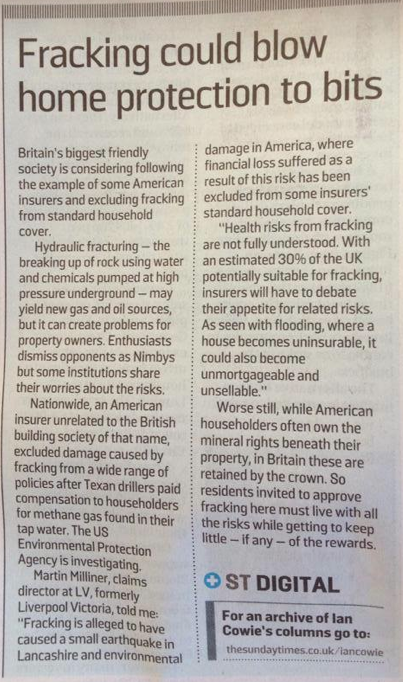 It confirms that UK homeowners are likely to face the same prospect as US homeowners in frack zones – namely insurers specifically excluding the impacts of fracking from their policies. It also confirms that insurers have serious concerns over the possible health impacts of fracking activity. It points out that 30% of the UK is vulnerable to the frackers – and that homes are likely to become not just uninsurable, but unmortgageable and unsellable. Unlike Americans, who can trade off the risks for the lucrative gains (short term at least), with menial rights held by the crown in this country, residents here would have to live with all the risks – without any prospect of sharing in the potential rewards. Even those of a Tory/capitalist disposition cannot, surely, tolerate this!! This entry was posted in Uncategorized on April 14, 2014 by Bridgend's Green Leftie.